Arid lands and sacred deserts, the idea of vast, sand and rock has fired our imaginations for a thousand years and raised a thousand questions: What do the deserts look like? What kinds of plants and animals live there? How do its human residents feed and clothe and defend themselves? 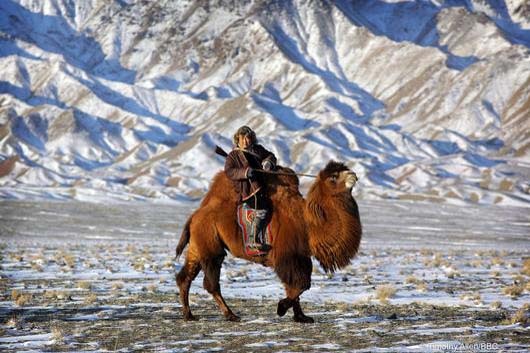 Literate travelers, naturalists, missionaries, adventurers, poets, artists, novelists, musicians (even crashed pilots) have journeyed to the deserts of the world. Many of these visitors have found what they’ve seen, if not always lovely, then at least otherworldly. They have found strange places that are treasure troves of wonder and opportunities for self-discovery. From The Most Beautiful Desert of All, a unique perspective on desert literature by archaeologist Philippe Diolé to the study of the diversity of global desert societies in Desert peoples, Archeological Perspectives and Life in the Furnace, a BBC Documentary about the desert, desert societies have been central to the anthropological imagination. Desert Peoples, Archaeological Perspectives is a book that examines the key concepts vital to understanding human adaptation to marginal landscapes and the behavioral and belief systems that underpin them. The various studies explore the relationship among desert hunter-gatherers, herders, and pastoralists and provide an issues-oriented overview of hunter-gatherer societies in desert landscapes that combine archaeological and anthropological perspectives. For centuries, deserts have captured the public imagination as places of extremes. These are landscapes that might be perceived as impenetrable barriers to human occupation or instead as the domain entered into by individuals pursuing a revelatory experience. They are of course also the same terrain through which the Tigris and Euphrates Rivers passed and which, when hydraulically ‘‘tamed,’’ became the agricultural powerhouses of the Near East. The classic ethnographies of hunter-gatherer societies – of the Ju/’hoansi (Kung), the Paiute and Shoshone, the Arrernte, Pitjantjatjara, and Pintubi – all deal with desert peoples. Surprisingly, very few analyses have adopted a comparative perspective on a global scale. Battling through a sand storm in Mali, Mamadou must get his cows to a remote lake but desert elephants have arrived first. Can he find a safe way through the elephant blockade? Alone for weeks on end, Tubu women and children navigate the endless dunes of the Sahara. How does young Shede know where to find the last oasis, three days walk across the sea of sand? At the height of the drought we witness a spectacular frenzy: two thousand men rushing into Antogo Lake to catch the fish trapped by the evaporating water. When the rain finally arrives in the desert it’s a time for flowering and jubilation – and love. 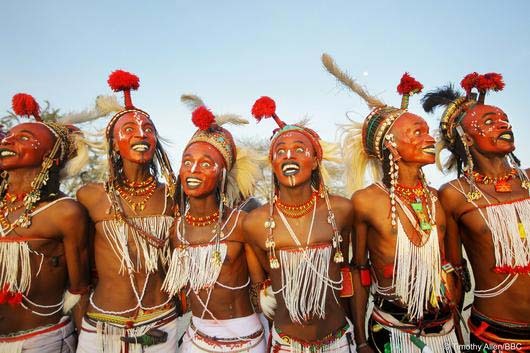 The Wodaabe men of Niger put on make-up for an intoxicating courtship dance and beauty contest. The journey into the desert resembles an exploration of spiritual meaning.